Every four years we’re given a present, an extra 24 hours that we bundle up into one day that we call “Leap Day”. Where does this time come from? Well, astronomically speaking, it takes the earth approximately 365 days and 6 hours to travel around the sun. Add up those 6 hours for 4 years and you’ve got 24 (thank you Ms. Summers for all of those multiplication flashcard drills in 4th grade). To keep our old calendars in line, we add that extra day in during that 4th year and call it “Leap Year”. 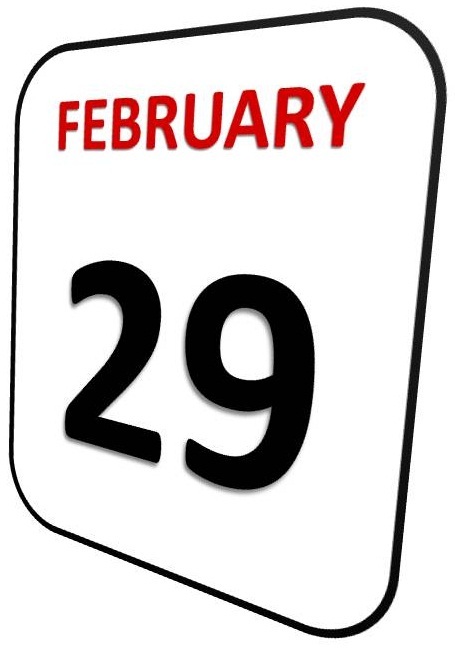 It dawned on me this morning that if there is one day that should really be given to people as a bonus day, a day to do whatever you wish, a holiday if you will, it is Leap Day. It only seems fitting as (1) we get by just fine without it 3 out of every 4 years and (2) since it’s in essence a “catch up day” for time, we should all be allowed to catch up. Catch up with some time you’ve missed with your kids. Catch up on a good book you’ve been wanting to read. Catch up on a project around the house. Catch up on a trip to a museum that you’ve not had the chance to get to yet. Catch up on some thank you notes, phone calls, or coffee with a friend. It’s a bonus day. Do something with it that you don’t have the chance to do on all of the other regular, feet-stuck-in -the-mud days. Take a leap! I guess, if you wish, you could use it to catch up at work, but I’d like to propose we do anything but that. Work is a constant catch up. Everyone is overworked these days. People continually feel pressured to get one more thing done yesterday. It seems like in this everyday environment, the one thing we could all use is a day away from that. And again, since we don’t have it the vast majority of the years, who will miss it in the work calendar this year? Come on, everyone! Carpe Leap Day! Seize your day. Tweet it (#OccupyLeapDay). Share it on Facebook. Pass this post along on Tumblr. +1 it for Google. Whatever gets the word out. Take back your day! This entry was posted on Thursday, January 26th, 2012 at 4:20 PM and is filed under daily muse. You can follow any responses to this entry through the RSS 2.0 feed. You can leave a response, or trackback from your own site. Great thinking! I invite you to join the LEAP DAY LIBERATION FRONT, the only organization devoted to this cause. Join us on Facebook at https://www.facebook.com/pages/LEAP-DAY-Liberation-Front/383259461699708 (sorry, too cheap and lazy for a web page). Reblogged this on A Librarian by Any Other Name.